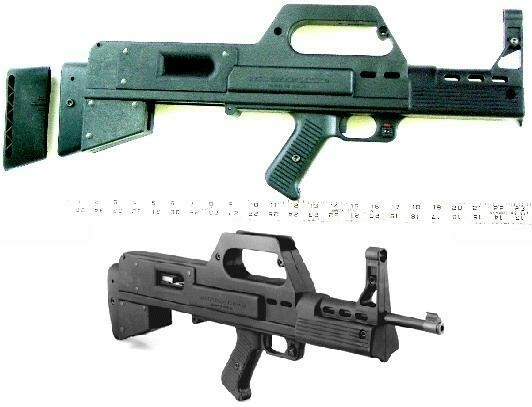 As I understand, these stock actually -WERE- first designed for service purposes, but for POLICE issue, not military. It was the late 1980s (AH, Miami Vice! ), and most Police Departments, even the smaller ones, were following the trend to institute Rapid Reaction/Intervention (SWAT) teams. These teams obviously required "Special Weapons" of high punch, maneuverability, and threatening look, which is important in Police duties: often handling a nasty-looking gun can make the difference between a scared opponent who surrenders at first sight and a criminal who decides to push his luck in a shootout; for the same reasons, even average patrolmen could need such a weapon. Now, at that time, the Sturm-Ruger MINI-14 series of semi-automatic rifles were some kind of "Weapon of Choice" between small Police departments and Sheriff offices when it was about centerfire long arms; not to mention that some of them even had acquired limited quantities of the AC-556 Weapons System (same as the MINI-14, with either long or short barrel, fixed stock or sidefolding with pistol grip, but capable of selective-fire); this thanks to the rain of Federal fundings that the Reagan administrations had distributed between small townships and Counties for their Police authorities in a "Public Safety support" program. SWAT teams, as I stated above, required special weapons: just like today, back then those "Special Weapons" were M-16 rifles and carbines, and MP-5 submachineguns; but back then, those weapons were WAY rarer on the market, and more expensive even for Police authorities, especially if it was about small departments who couldn't efford them. MWG Company engineered the "Muzzelite" Bull-Pup stocks with this purposes in mind. Them are very cheap to buy, even by the number, if compared with a stock of COTS M-16 rifles/carbines or MP5-SMGs. The rifle converted with such a shell immediately becomes more maneuverable in confined spaces, more versatile as far as the attachment of tactical accessories is concerned, and most important, it acquires an "evil" threatening look of all respect. The MINI-14 rifles equipped with the Muzzelite bull-pup stocks don't seem to suffer for major flaws or drawbacks from the conversion; but now the times are changed, and even those Police Departments who keep in stock semi-automatic rifles (and haven't directly turned to selective-fire assault weapons) can go for better things, like AR-15s; not that they couldn't then, but back at that time, the Police Departments that could efford them were not as many as now. The MINI-14 is essentially a sporting rifle, and even if the Muzzelite Bull-Pup can still be considered an excellent sporting or survival solution, at present times there are much better things to go for when it's about Police patrol long arms. As for the conversion of selective-fire/full-automatic AC-556 System rifles, I don't know if the Muzzelite system was ever engineered to convert it in such a way; the AC-556 rifles are basically .5'56mm-chambered, scaled-down M-14 rifles, and the selector switch is placed exactly where it is in the M-14. I don't know if the port on the back right side is wide enough to allow the shooter to reach and operate properly the selector; otherwise, I don't see any other inconvenience that could prevent the bull-pup conversion of an AC-556 Series rifle/carbine with the Muzzelite kit, sure still purported that the kit can tolerate the stress of the rifle being fired in full-automatic with such an high Rate-Of-Fire as the one of the AC-556 weapons: I am not even sure that an experiment in such way was ever made. Not to mention that the Muzzelite Bull-Pup stock has no provision for left-handed use; well, it's a major flaw of most part of Bull-Pup designs (the only one to be READILY used by the lefties, as far as I know, is the latter Belgian FN F2000, while others like the Austrian Steyr AUG and the French FA-MAS can be converted with very little armoury work... well, at least the FA-MAS, while the AUG can easily be converted even by the shooter himself; the British SA-80 system can be converted to left-handed use but it needs EXTENSIVE armory works as the entire breech-bolt has to be disassembled and re-assembled in reverse position). With the technologies available today, anyway, I could not see any reason why a Police or Military should go for the Ruger/Muzzelite bull-pups when they can efford and have much better weapons like the Steyr AUG.